The 1930's and 40's were the heyday for monster movies at Universal Pictures. Horror icons like Boris Karloff (Frankenstein and The Mummy), Bela Lugosi (Dracula), and Lon Chaney, Jr. (The Wolfman) helped Universal corner the market on the undead. Critics and the movie-going public delighted in cowering under their theater seats while watching their favorite fiends, and Universal kept the title of undisputed "king of the undead" for decades. Flash forward 80Ys from the glorious gory days of Universal and the US banking industry has an "undead" theme going on too. First there were zombie banks identified as those banks with no assets of value or deposits of worth during the early days of the financial crisis. 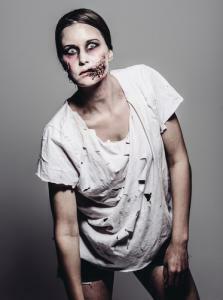 Now there are zombie customers that add little value to banks yet cost a lot to service. The FDIC tags the unbanked household total at almost 10mm households. Furthermore, the percentage of underbanked households that use a limited number of banking services comes in at around 20% of the population (24mm). Combined, that's 27% of households that are largely bypassing what banks are offering. The FDIC survey also found that about 36% of unbanked households said the main reason they did not have an account with a bank was because they did not have sufficient money to meet minimum balance requirements. Perhaps that is why 22% of unbanked households said they used a prepaid debit card in the prior 12 months vs. 13% of underbanked and only 5% of fully banked households. Finally 25% of households have used at least one alternative financial service (AFS), such as non-bank check cashing or payday loans in the past year. This is a difficult topic for banks as there is heavy regulatory pressure to avoid credit issues, not charge for overdrafts and yet have the expense of administering low balance accounts. Given the size of this potential customer base, banks continue to test out strategies. Some strategies that may offer a place to start include: exploring opportunities to deploy and market checkless checking accounts; providing other payment options to meet transactional needs; integrating mobile banking with branch-based strategies; finding ways to help maintain relationships through economic transitions such as job loss. These service options should cost less to administer than traditional checking accounts and can help keep consumers out of trouble. TD Bank has successfully reached out to lower end customers noting, "One in five consumers with a bank account are using alternative banking products, which adds needless cost to their monthly budget. Consumers who are using these types of services should have a conversation with a banker to learn about less expensive financial products that can meet their everyday financial needs." It seems some people are less likely to have that conversation, perhaps because they are afraid of rejection. As a result, they stick with more expensive prepaid credit cards or check cashing services. Community banks can play an important role in helping and perhaps capture some new customers that will grow in value over time by offering the right set of products. Who knows, perhaps community banks with the right combination of products can even wake the undead and show them that they have a lot to live for in dealing with smaller banks. Yields are down 4bps amidst falling oil prices and sovereign debt hitting a record low. Community banks should note small business customers will see new higher pricing from UPS and FedEx that experts say could jump as much as 50% higher. To push companies toward smaller boxes, the delivery companies are switching to a "dimensional" model that charges based on the height of the box multiplied by its width and then divided by 166 to calculate a "dimensional weight." The FDIC says that in order to properly handle interest rate risk, banks should have strong asset liability management policies, reasonable investment and exposure limits, assignment of accountability for risk measurement and controls, and appropriate management information systems that help inform strategic decisions of senior management and the board of directors. Our advice is to run this checklist against your processes to be sure you are covered. Fed Boston President Rosengren said he expects the Fed to use "a patient approach" in raising interest rates given low inflation pressure and a desire to continue to boost jobs. He also indicated the 10Y Treasury yield "at some point in the normalization process will not be as low as it currently is" and that investors should expect market volatility as the Fed takes action. He projected the Fed funds rate would reach 3.75% to 4.00% over a 2Y period once the Fed begins. A survey by the Pew Research Center finds the average net worth of households under age 30 has tanked 48% since 2007 and now sits at $44,354. The CFPB said it is in process of writing rules and looking at a variety of ways to require payday lenders to make sure all borrowers have the ability to pay back their loans. The CFPB is concerned borrowers are becoming trapped in a rolling debt problem and continually rack up fees, with little way out. You might be interested to know that the total amount of problem loans for the banking industry has declined almost 66% from its peak. Bankers will be closely watching the Fed this year as the scales tip toward a rate hike in the 2Q perhaps. The first meeting of the year is on 1/28 and the minutes from the Dec 17 meeting get published 1/7 so watch for clues.